Finished 'test' version. (Minus balance lead which I added next). I've just finished building a replacement battery pack for my Ecomower. 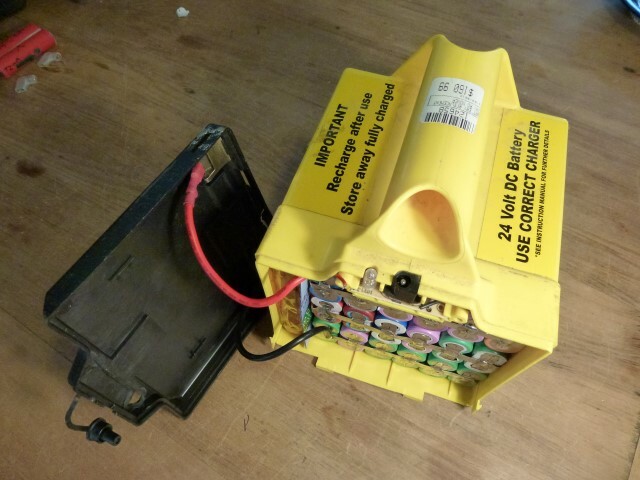 The original battery pack consists of two 12V 10Ah Gel batteries which I got second hand via TradeMe. 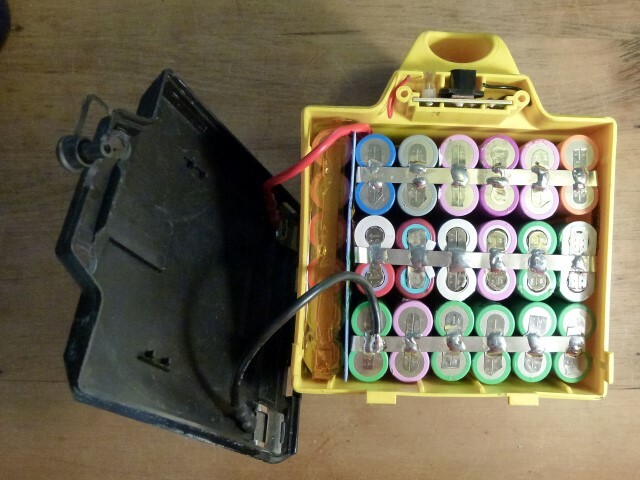 The new pack consists of 84 recycled laptop cells (18650s Lithium-Ion) wired as 7 series groups of 12 parallel cells for a nominal voltage of 25V and 21Ah giving roughly 500Wh - or twice the capacity of the old Gel batteries when they were new. And it weighs 2 kg less than the Gel pack. As you can see they are perfectly sized for their box. Lucky. Next: add a BMS (battery management system) to help keep the groups balanced and to protect from over-discharging. In the meantime I'll use a balance charger to charge it and stick a Lithium cell monitor on it to warn of low voltages. I tested it in the Economower and it worked great - but the cells are currently not charged so I'll charge them over night and mow the awn tomorrow and see how it performs in a real world test. I'll give some more details on how I built it over on my Reusing Old Laptop Batteries page. I've added a BMS to the battery to keep the battery from being over-charged or over-discharged. 28 Volt on the battery, dropping to 27 V at peak load. I'm guessing it reached over 90 Amps. Which is a lot to ask from a cheap 30A/60A BMS. So I've bypassed the BMS for the moment. Just mowed our lawn and got some more data. Based on the measured capacity of the cell pairs before assembling, the pack should have a total capacity of 21.8 Ah and 570 Wh (from 84 18650 cells). Note: 94.18 Amps peak current draw divided by 12 cells (in parrallel) equals 7.8 Amps per cell. That's quite a lot from a used cell. Assuming these cells are rated for 2C, then it's running almost 4 times it's rated load. Sub-optimal. This is part one of a larger project to see how much can be done with recycled laptop batteries. Currently our local IT recycling center receives about 1000 laptop batteries a month - which they then ship overseas to be processed. I'd much rather see them re-used locally.